Ranise Farm is plesed to introduce their Ligurian jarred products. Different kinds of specialities for wholesome and good meal. You can find and taste our olive paste and stuffed hot peppers great for a starter! 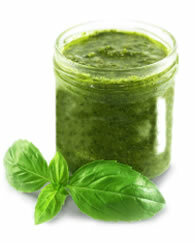 And why don't you try our Ligurian Pesto? A fragrant sauce for spaghetti or lasagne. If you are looking to prepare something new, exciting, yet delicious try our walnut sauce with ravioli.